"Bishonen" are the beautiful boys that overpopulate shôjo manga. Flowers & Bees is the manga that makes men out of beautiful boys. Beautiful men. Masao Komatsu might think of himself as a total loss. But high-school life is never so bad that it can't get a little worse, and unfortunately, it turned out he still has a few crumbs of self-respect hiding here and there. Gorgeous sisters Kiyoko and Harumi will be happy to vacuum them out of his pockets--with each and every visit by Masao to World of Beautiful Men, the men's salon they own. Why shouldn't young men, too, get the chance to have their lives ruined in the pursuit of unattainable standards of beauty? Though mocked by classmates and stared at on the street, Masao vows to remain faithful to his makeovers--determined to become the man hairdressers, estheticians, and fashion magazine editors only dream that women dream of! 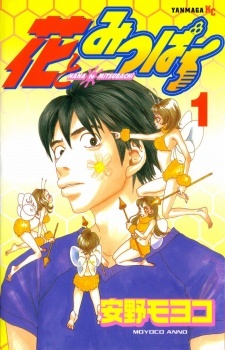 Hana to Mitsubachi was published in English as Flowers & Bees by VIZ Media from October 1, 2003 to May 10, 2005.